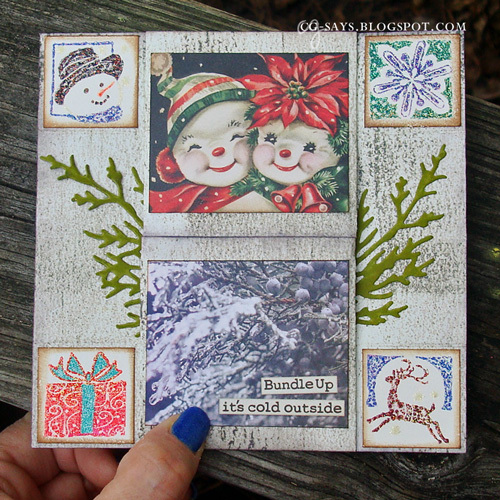 The theme this month at Pile It On is Anything Christmas/Winter. We're sponsored by Pink Gem Designs and I previously used their "Chilly Ice Skating" digi stamp to make a holiday card. This time, I used a new Anna Griffin snowflake die that I received as a gift from Mom. She's visiting & we're having lots of crafting fun! I embossed the sentiment on Vellum, and adhered it to more vellum with red tape. I overlapped the tape to create a border that I heat-embossed with gold tinsel embossing powder. 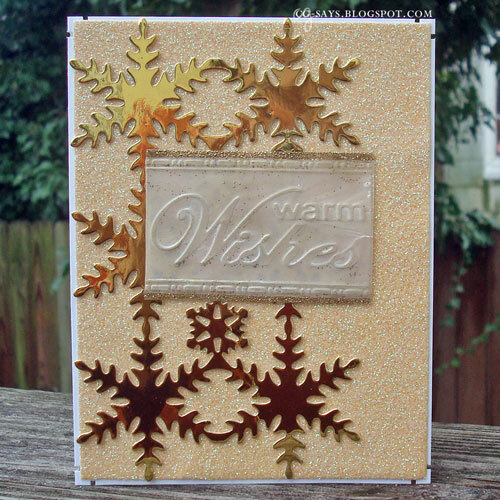 The snowflake lace was cut from a gold-foiled cardstock, and the background is a preglittered cardstock. 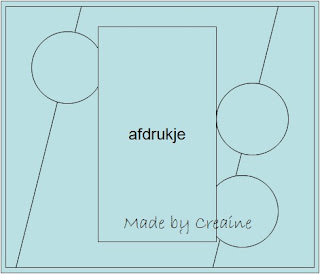 It's a fairly simple card, but I like the result. Update: This was the prize winner for Quick Quotes #58! The fabulously talented Ike has started a new challenge blog, Show Us Your Pussies, dedicated to our Feline friends. 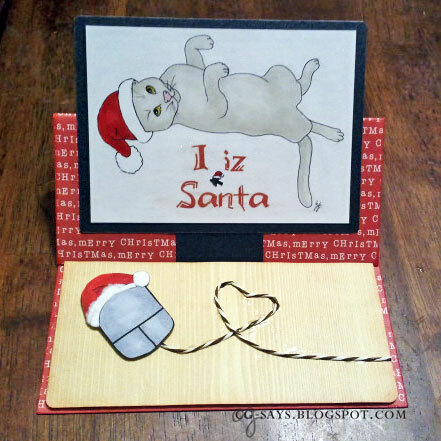 I've already joined the challenge with her freebie CatMouse Tree, but I couldn't resist using her other freebie, "I Iz SANTA", along with "Holiday Mouse" by Floppy Latte Designs. I made an easel card to sorta look like a computer monitor and desk. I used twine to make the mouse cord. I colored the image with Copic markers, and painted the background with a clear Wink of Stella glitter pen. I made this for my husband, as we've enjoyed I Can Has Cheezburger together on many occasions. Did you spot the 2nd mouse? I drew a little cursor arrow with a santa hat and glued it onto the "screen" just for an extra giggle! Update: This was chosen as a Top 3 for IkesWorld Challenge #53! I'm so happy I could puke rainbows! I grabbed this freebie digi stamp from Wonderstrange quite awhile ago, and I'm glad I finally got the perfect opportunity to use it. I colored the image & background with Copics and added detail with Wink of Stella glitter pens. It's attached to the card with an Action Wobble. 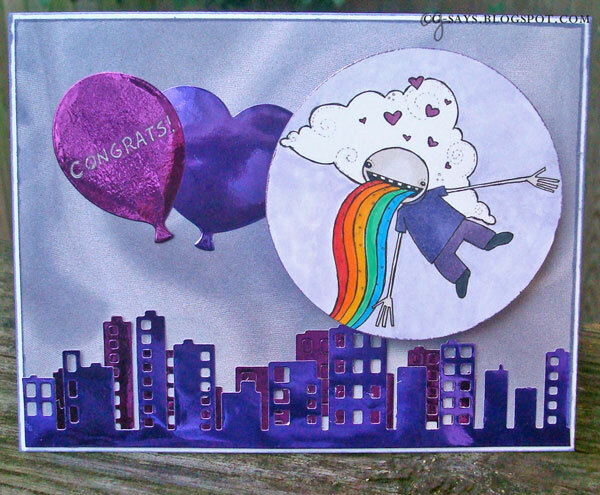 The cityscapes & balloons are cut from foiled cardstock with a MFT die & Elizabeth Craft dies, respectively. 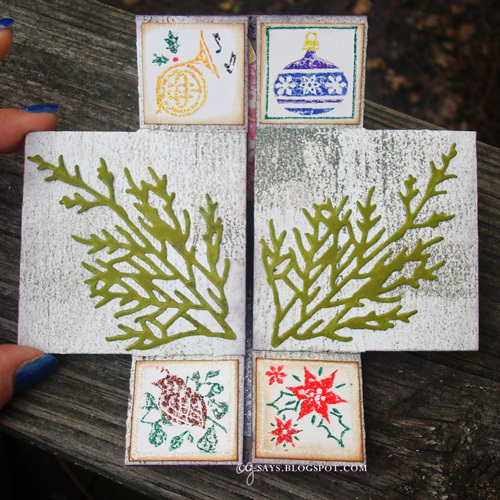 The background is a silk-patterned paper from my stash. I stamped the sentiment with black StazOn ink and wrote over it with a silver gen pen. 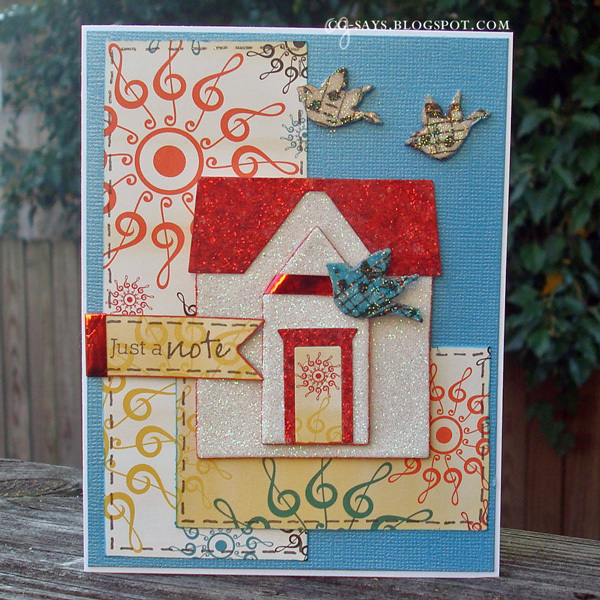 The Crafter's Cafe Challenge theme is Tags. We're sponsored by Rick St. Dennis, MFA, Angie's Cards & Digis, and Melonheadz Illustrations. I used "I Think I've Lost My Buttons" by RSD to create a tag atop a box for lost buttons! 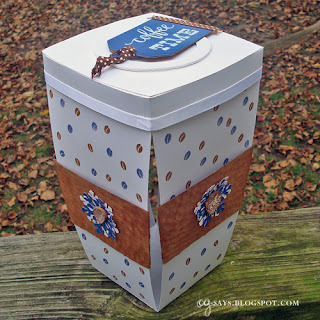 I originally decorated this recycled box for the first Pile It On Challenge of 2012 ... I removed the top portion and remade it into a box for loose buttons. Update: This was chosen as the Winner for Crafting When We Can #109! 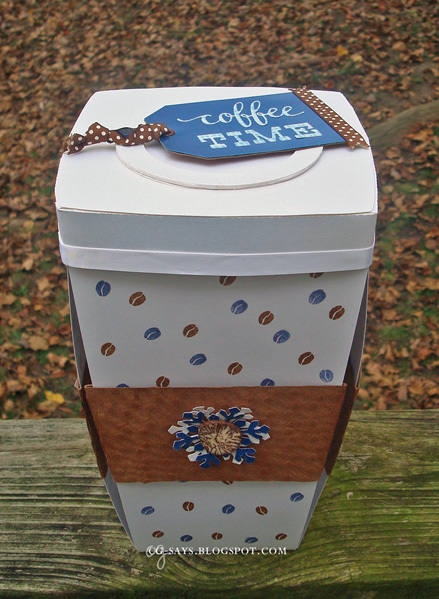 It's time for the Coffee Loving Cardmakers' Winter Blog Hop, so I made a gift box featuring a YNS die I won from their Summer hop! The box is large, about 9 x 5 inches, and I created it in SCAL and cut it on my Silhouette Cameo. 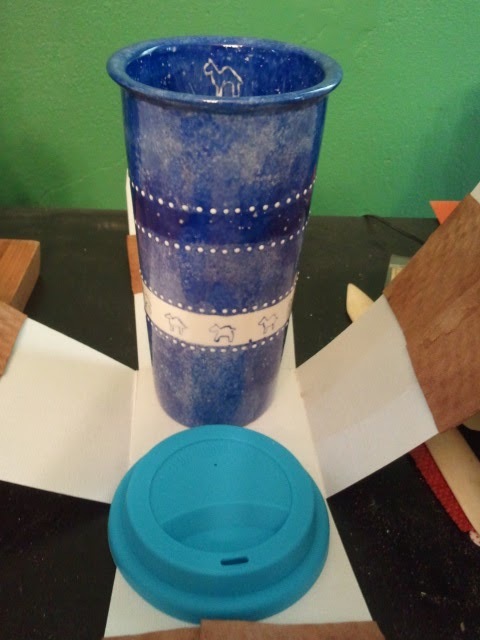 I took apart some actual coffee sleeves, inked the blank side, and glued them around each side. The snowflakes were made with a Martha Stewart punch, and I added some betel nut pieces in the middle. I used a coffee bean stamp from a Stampin' Up! set to deocrate the sides. The blue tag was bought at Ikea years ago, and I backed it with a piece of a coffee sleeve. The words were die-cut from an adhesive paper; the "coffee" is a YNS die, and the "time" is made from a letter die from QuicKutz. I had tons of fun making this, almost as much fun as I had looking at all the gorgeous projects at the Coffee Loving Cardmakers' Winter Blog Hop! The fabulously talented Ike has started a new challenge blog, Show Us Your Pussies, dedicated to our Feline friends. 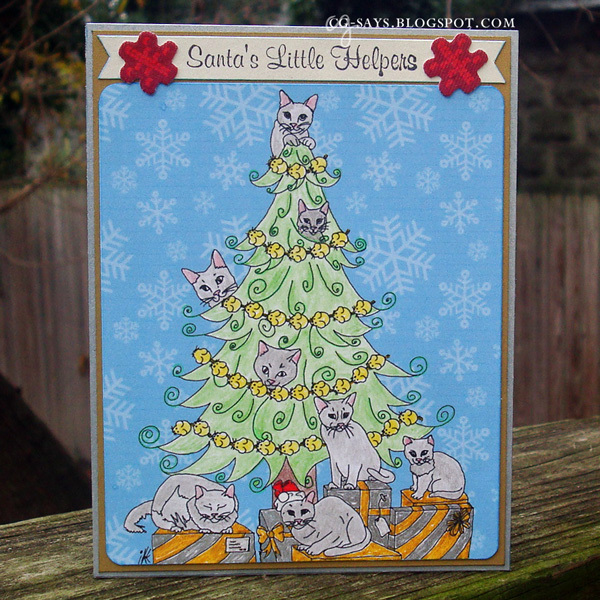 I couldn't resist using her fun freebie "Catmouse Tree" to make a winter card. 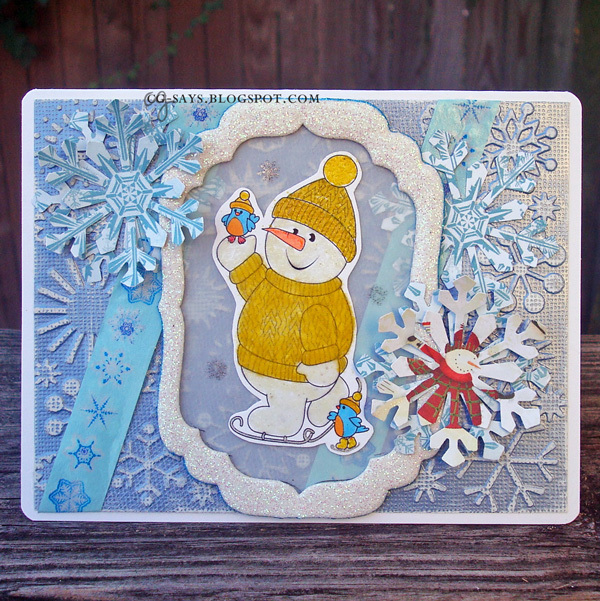 The sentiment is a House Mouse stamp, and the snowflake background is by Bird's Cards.I colored the image with colored pencils and glitter & gel pens. The red snowflakes are fabric stickers. If you'd like to try your hand at your own Never-Ending card (also referred to as an Infinity or Everlasting card) here's a pictorial tutorial at Dawn's Stamping Thoughts, and a video tutorial by Jules from the Cards und More team. For the bases, I used a distressed-looking double-sided DP. I inked the edges with Dusty Concord distress ink from Ranger/Tim Holtz. 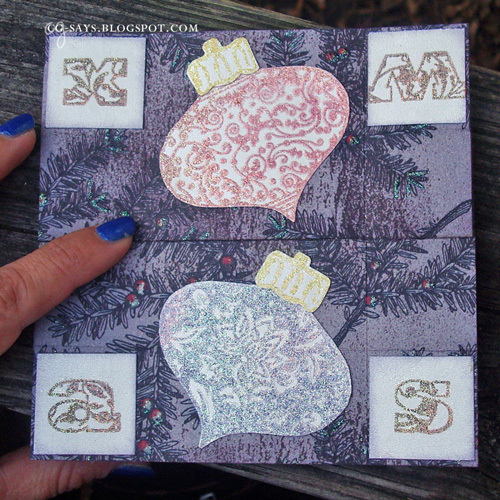 The "Cozy Xmas" sentiment was stamped in Vintage Photo distress ink & watermark ink and heat-embossed with holographic glitter embossing powder. The letter pieces were distressed with Dusty Concord, but the other stamped pieces were distressed with Vintage Photo. The square stamps are from Inkadinkado and the ornament stamps are from Spellinders; I colored them with Marvy embossing markers and heat-embossed them with more glitter. 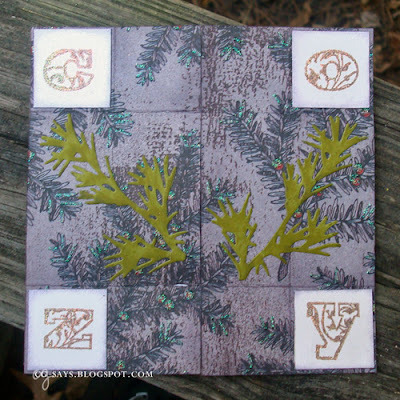 The pine branches were die-cut from a olive green paper & distressed with Crushed Olive ink. The printed images on page 2 are from DPs in my Xmas stash. I just adore those cute snowpeople! Update: I won a lovely prize for the Cards und More Infinity Card challenge! I can't help it, I get a big giggle out of this image by Wonderstrange! 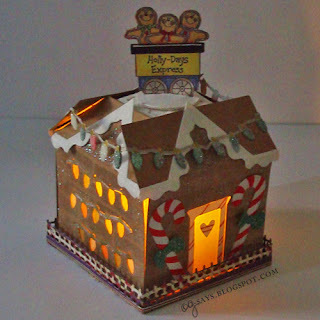 It's just perfect for the current "Naughty Christmas" challenge at the Sisterhood of Snarky Stampers. The shaker is filled with Diamond Dust, which means I'm basically sending a card full of crushed glass! I created the snowglobe myself, with circle dies. The globe frame is heat-embossed with white glitter powder, and the bottom portion is heat-embossed with black glitter powder. The banner is a wood veneer piece that I inked in black; I used letter stamps to heat-emboss the sentiment in neon orange. The image is colored with glitter & gel pens, and the background is painted with a glitter Wink of Stella pen. I used pom-pom wired ribbon for the bow & to hang the banner. The background paper is an old favorite form my stash. Hope this card brings someone a big smile and doesn't fall apart! Update: This made the "Nice List" at CASE-ing Christmas! 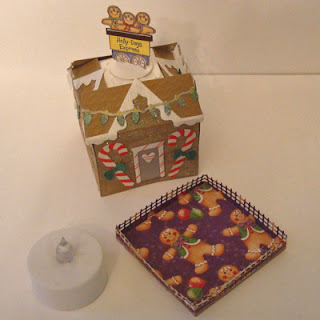 This is my second time working with Karen Burniston's "Holiday House" die set from Elizabeth Craft Designs; my first was my Gingerbread House Lantern. 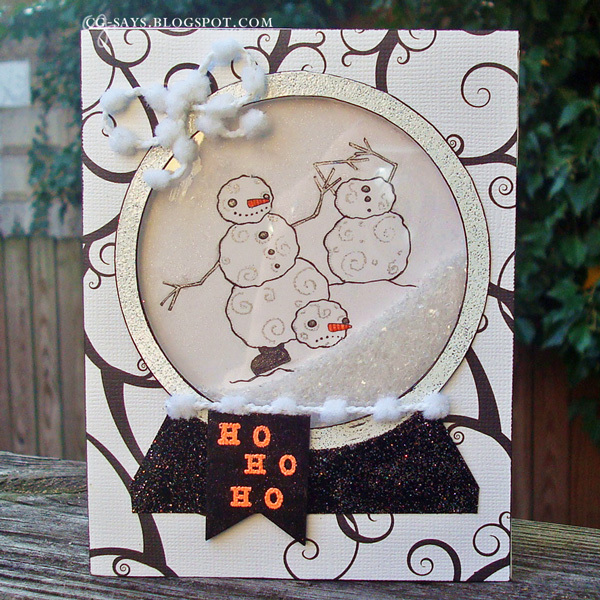 This time, I was inspired by the sketch & chance to be on the DT at Card & Scrap. The birds are wood shapes that I decoupaged with music-patterned wax paper from Tim Holtz & heat-embossed with glitter. 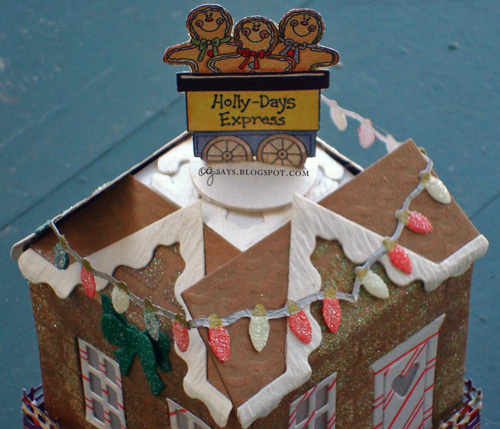 The sentiment stamp is from Jillybean Soup, and the red ribbon is recycled from packaging from a bake sale! 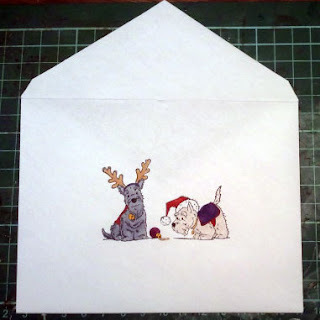 The lovely paper is from my stash, and I added the faux stitching with a black glitter pen. 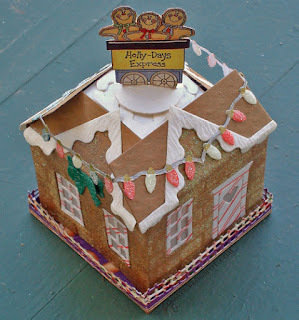 The house is cut from glittery foam. 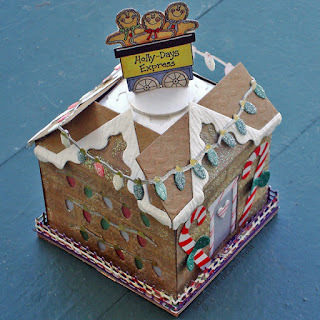 December Challenge at UnstampaBelles - Sparkle & make us smile! The UnstampaBelles December challenge is Sparkle & make us smile! Remember: no stamps! This will be our last challenge until February 6th, so be sure to play along! 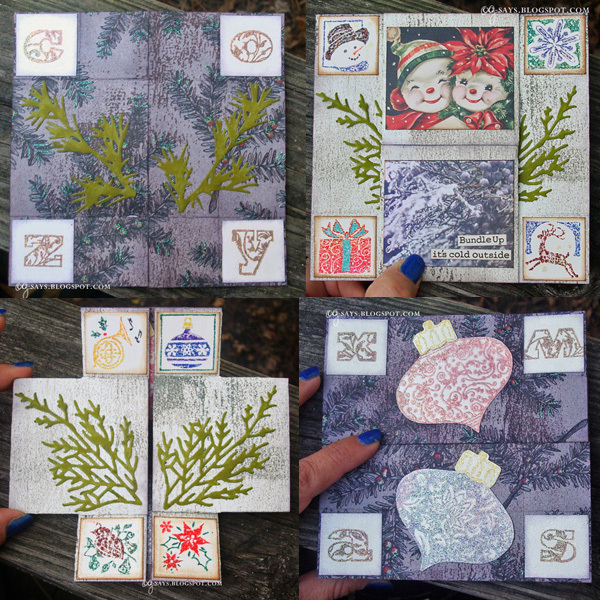 This was my first time playing with Karen Burniston's "Holiday House" die set from Elizabeth Craft Designs. Her Pop-It-Ups are so fun, and I adapted this set to create a little lantern. I used watermark ink to stencil the brick pattern on the outer houses, heat-embossed them with sticky powder & covered them with peach glitter. The door- & window-frames were cut from a paper I made myself with a red gel pen & a ruler! I colored the light strings with metallic pens, and used Marvy embossing markers & more sticky powder to cover the bulbs with glow-in-the-dark glitter. 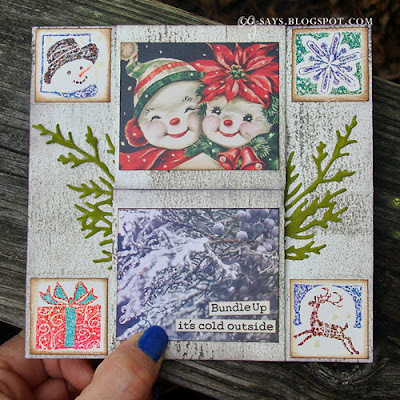 The theme this month at Pile It On is Anything Christmas/Winter. 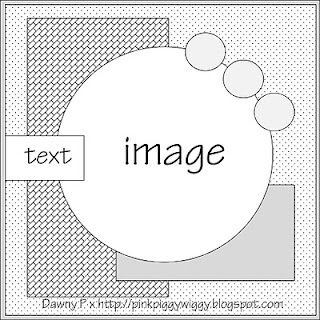 We're sponsored by Pink Gem Designs and I used their "Chilly Ice Skating" digi stamp to make an interactive easel card. This is a regular A2 sized card, but there's a lot going on! I donated this card along with several others & a bunch by my talented Mom to the church on the corner, who were having a craft fair at their Advent celebration. I really want to get my cards out there, and this was a fun opportunity. All the funds are going to their charitable fund. 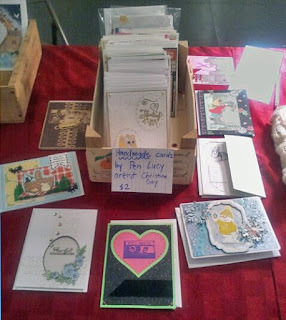 Here's how they displayed my cards -- love how they described me, made me blush!